Brother John Dunbar, S.C., is marking his 60th year with the Brothers of the Sacred Heart. He was born and raised in the South Bronx in St. Luke’s parish, where he attended the parish school, conducted by the Brothers of the Sacred Heart, from the sixth through eighth grades. He also attended the Brothers of the Sacred Heart Juniorate H.S. in Metuchen, N.J. 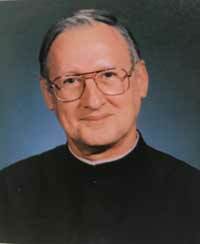 He professed first vows in 1958 and final vows in 1961. He earned his bachelor’s degree in secondary education at Spring Hill College, Mobile, Ala., and a master’s degree in theology at Fordham University, the Bronx. From 1961 to 1967, he taught typing, religion and global studies in schools throughout the Province. From 1967 through 1997, he taught children at the Brothers’ schools in Kenya and Zambia at the high school and junior college levels. He also was appointed assistant education secretary for the Diocese of Meru, Kenya, and as delegate of the diocese to the Kenya Catholic Secretariat. From 1997 to the present, he has been teaching computer literacy, art history and global studies at Msgr. McClancy H.S., East Elmhurst.